As a charter member of the Santa Cruz Woodies it seemed only natural to have Seal design the logo for the California car club. The logo has been used on shirts, embroidered jackets, decals and other club collateral. 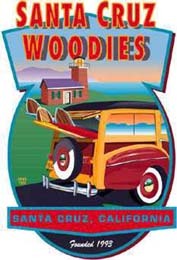 The logo features a Ford woody (similar to one owned by Seal) parked at Santa Cruz's famous surf spot "Steamer Lane".